Well hope your new year is going good so far, bye! Hello, hope everyone's Christmas was Grand! I got a Wii (Tis Awesome), Zelda (One of the Greatest Games EVAR! ), and various other things. With the money that I received I got various things. (KH:II, Chibi Robo, Just Friends <-- Hilarious!, etc.) I moved my fan manga to the Fan Manga section... I need to update, but every time I try the page just freezes up... 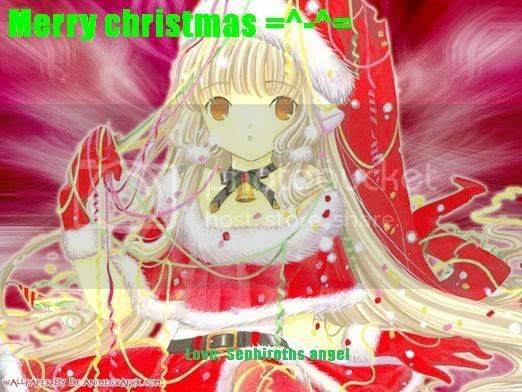 I received a nice Christmas card from Sephiroths angel. I also have began posting my various Miis I have made to a place called miiplaza.net. Here's a link to my miis: My Miis! Here's a sneak peak at my Miis! Last night I posted my RowdyRuff doujinshi in the fan manga... I have a new page ready to post, but for some reason my ISP will not let me... Well tis all for now... Merry Christmas!! I have finished the background... Here is a little taste! Please check it out! Check out my second one too! I will probably update my doujin... Except it will be smaller than usual because my ISP is wonky... I will post a higher quality one on Monday, if the smaller one isn't good enough... Alright, bye! I was thinking and I have now decided some of the aspects of my next doujin... It will be a sequel to the one I'm writing now. I'm currently drawing page 19, I have colored up to page 10 and I need to ink the rest... I'm almost finished with the first "Adventure"... The title of it is "The Grim Adventures of the Rowdyruff Boys"... What do you think? Considering the next "Adventure" there will be other familiar characters involved... Expect the characters of Xiaolin Showdown to show up... I am going to change my redesign of the characters (from Xiaolin)... Mainly hair and clothes... I probably won't update this week, but I will do a double update when I can... I'm going to be very busy near the end of the week and pages 6-8 need to be edited, so... Well tis all for now, bye!